TIME has named the Silence Breakers, the individuals who set off a national reckoning over the prevalence of sexual harassment, as its Person of the Year 2017. 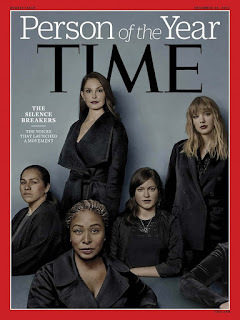 The magazine's editor-in-chief Edward Felsenthal revealed the selection Wednesday on TODAY along with the cover, a composite group photo that includes actress Ashley Judd, singer Taylor Swift, former Uber engineer Susan Fowler and a woman whose face cannot be seen. The 'Silence Breakers' who started the #MeToo movement have been named Time 'Person of the Year'. Last year's winner, President Trump, and China's President Xi Jinping came in second and third place. Time Editor-in-Chief Edward Felsenthal called the movement 'the fastest moving social change we've seen in decades'.